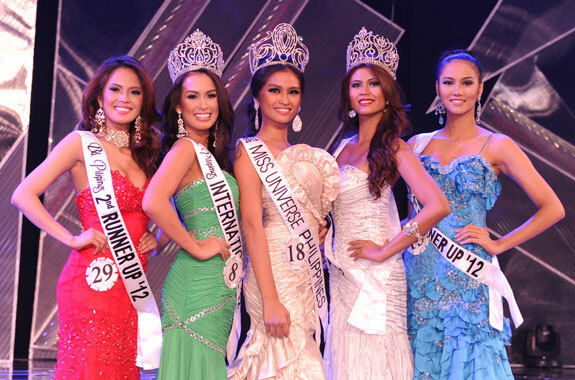 The 49th annual Binibining Pilipinas was held last April 16 at the Smart-Araneta Coliseum in Quezon, City. Xian Lim, Georgina Wilson, Iza Calzado and Miss Universe 2010 4th run-up, Maria Venus Raj hosted this prestigious event. 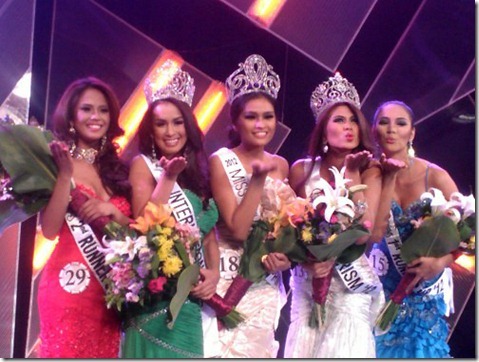 The coveted Miss Universe Philippines 2012 crown was won by 22 year old Janine Marie Tugonon from Balanga, Bataan. She was the 1st run-up in last year's Binibining Pilipinas 2011 contest. Standing 1.73m tall, Tugonon will represent the Philippines in Miss Universe 2012 later this year. Nicole Schmitz was crowned as the new Bb. Pilipinas-International 2012. She is 23 year old beauty from Cebu City. Nicole will compete in Miss International 2012 in China. The stunning 18 year old Katrina Jayne Dimaranan from San Juan won the title of Bb. Pilipinas-Tourism 2012. She will enter the Miss Tourism Queen International 2012 competition. Placed as the 1st run-up was Elaine Kay Moll. And the 2nd run-up was Annalie Forbes.